Paragon Backup & Recovery 14 Compact giveaway serial license code official from Paragon software. The difference with standard edition, compact edition decide hard-disk copier and partition copier. It provide basic features only. 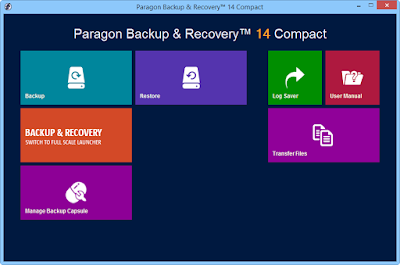 Paragon Backup & Recovery 14 Compact is a simple and powerful backup and recovery solution to secure stand-alone Windows desktops and laptops. It allows users to quickly back up image of almost everything from files, folders, or the operating system, to the entire content of a hard drive, and at same time recover/restore backup copy again to your drive when necessary. Various backup options available, you can plan your regular backup, you can run full, differential or incremental backups, the latter only archive changes since the last full sector-based image, thus considerably saving the backup storage space. Backup files can be saved to local partitions, external storage, optical media (CD, DVD, Blu-ray), network shares, FTP servers, virtual containers (pVHD, VHD, VMDK), and even a secured hidden partition on your drive, available only through this software! Also restoring data from backups is easy, you can restore an entire disk, separate partitions or only files you need from the previously created backup image. giveaway official provided by Paragon software. Visit the following giveaway page to get the license for free and follow the instructions. This Paragon software supported Windows 8.1 / 8/7 / Vista / XP 32 | 64-bit. Support for the latest HDD standards: AFD (Advanced Format Drive), 2TB+ and non-512B sector size 8.drives.